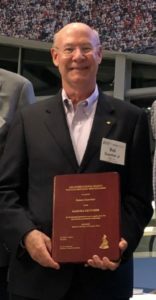 Robert N. Guenther Jr., NWL’s Vice President of Product Development, was recently awarded the prestigious Senichi Masuda Award at the 2018 International Conference of Electrostatic Precipitation in Charlotte, NC. The Senichi Masuda Award is for developing innovative uses or applications for electrostatic precipitator technology. Professor Masuda applied the technology to such diverse fields as the development of the “Boxer charger”, pulse corona for the destruction of organic trace elements, surface treatment of plastics for increasing paint adhesion, and add-on fast rise time pulse systems to conventional ESP power supplies. This award is to recognize innovations of this nature. The focus is directed to innovative ideas being under development. NWL would like to congratulate Bob on his recent achievement.